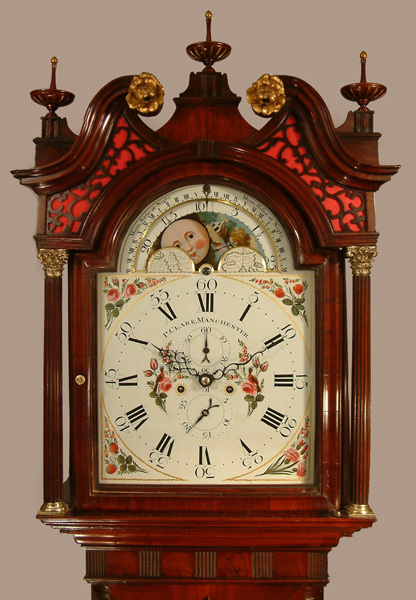 Peter Clare of Manchester Longcase Mahogany Circa 1780 - Height 93.3in. This Longcase Mahogany's Maker - P ( Peter ) Clare of Manchester is recorded born 1729, died 30th July 1799 ( "one of a Society of Quakers, a man of intrinsic merit as a mechanic and philosopher" ). He is further recorded as ( " �one of that special band of clockmakers who were scientists, inventors and, in his case, educationalists" ). A very well documented and respected clockmaker. 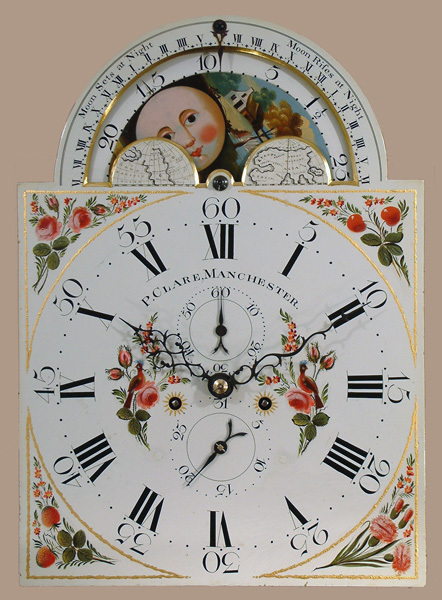 Please see "Greater Manchester Clocks and Clockmakers" by Edmund Davies for additional information, or contact me. Typical late 18C, high quality, long door, "Manchester" Cuban mahogany case with "flying saucer" finials, finely cast brass "rose" paterae, swan neck pediment with "silk" backed pierced fretwork under, ogee moulded hood door, reeded, Corinthian capped, hood columns with matching reeded trunk quarter columns, reeded details under throat moulding, book matched veneer reeded canted corner base panel, all set on ogee bracket feet. 14" breakarch, extremely high quality, very early, brass based ( rather than Iron ) painted dial with unusual moonphases to arch showing "moon sets at night" and "moon rises at night" - a short lived and very rare feature.This is an exquisitely executed dial which would have been seriously expensive when made. Blued cut steel hands. High quality, 8 day, 4 pillar, hourly ( rack ) striking movement. P ( Peter ) Clare of Manchester is recorded born 1729, died 30th July 1799 ( "one of a Society of Quakers, a man of intrinsic merit as a mechanic and philosopher" ). He is further recorded as ( " �one of that special band of clockmakers who were scientists, inventors and, in his case, educationalists" ). A very well documented and respected clockmaker. Please see "Greater Manchester Clocks and Clockmakers" by Edmund Davies for additional information, or contact me. 93.3" ( 237 cms. ) or 88.5" ( 225 cms. ) ex. finials.